Hope fitted with satellite transmitter. Photo by Barry Truitt. (Williamsburg, VA)—The odyssey of Hope, a whimbrel carrying a satellite transmitter continues to amaze scientists. 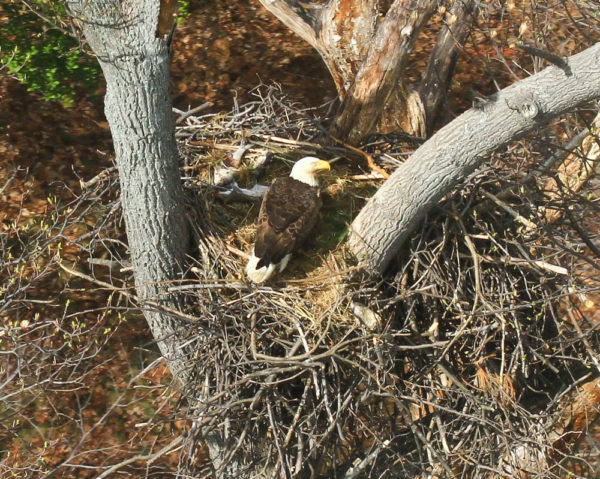 Hope was originally captured on 19 May, 2009 on the Delmarva Peninsula of Virginia. 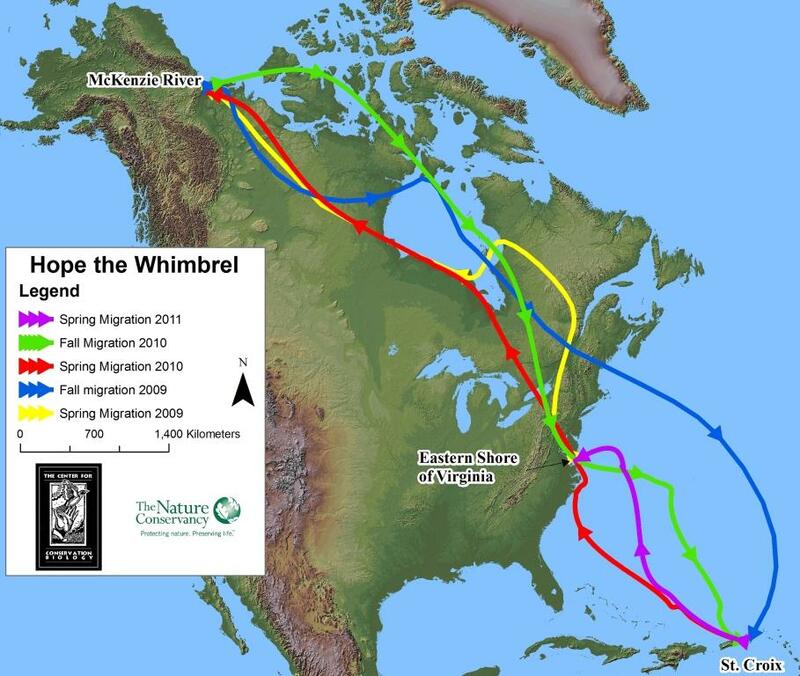 She left Virginia on May 26 and since that time has logged more than 21,000 miles (33,000 kilometers) flying between a breeding territory on the MacKenzie River near Alaska and a winter territory on St. Croix in the U.S. Virgin Islands. On Friday, Hope returned to Virginia following a 75 hour, 1,850 mile (2,900 kilometer) flight out over the Atlantic Ocean. 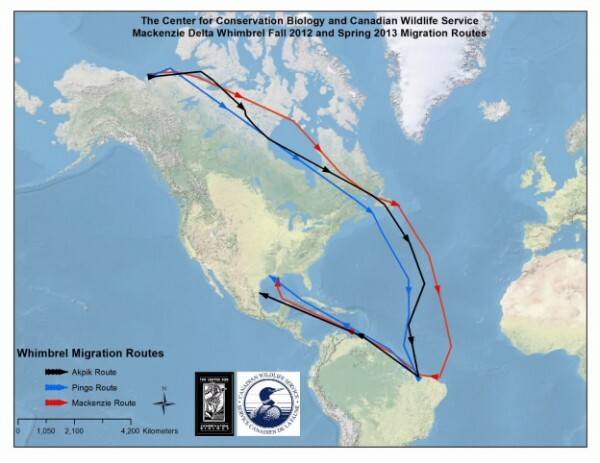 During the course of two full migration cycles, Hope has clearly demonstrated how distant locations are interconnected in the life of migratory species and how their conservation requires collaboration on a large scale. For three consecutive springs, Hope has returned to the same creek in Virginia where she has fed on fiddler crabs preparing for a transcontinental flight to her breeding grounds. The creek is part of the Western Hemisphere Shorebird Reserve Network. 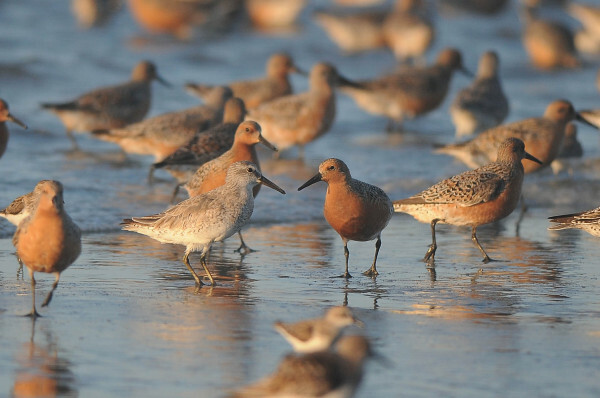 A network of sites considered critical to populations of declining shorebirds. Hope’s breeding grounds on the MacKenzie River are part of an International Important Bird Area and one of the areas of highest conservation value in Canada. Efforts are ongoing to protect the area considered by many to be one of the most pristine watersheds remaining in North America. For the past 2 years, Hope has wintered at Great Pond, a Birdlife International Important Bird Area on St. Croix. Protection of long-distance migrants like Hope requires that countries recognize their importance and work together toward effective conservation solutions. Hope is one of several birds that have been fitted with state of the art 9.5-gram, satellite transmitters in a collaborative effort by the Center for Conservation Biology at the College of William and Mary – Virginia Commonwealth University and the Virginia Chapter of the Nature Conservancy to discover migratory routes that connect breeding and winter areas and to id. 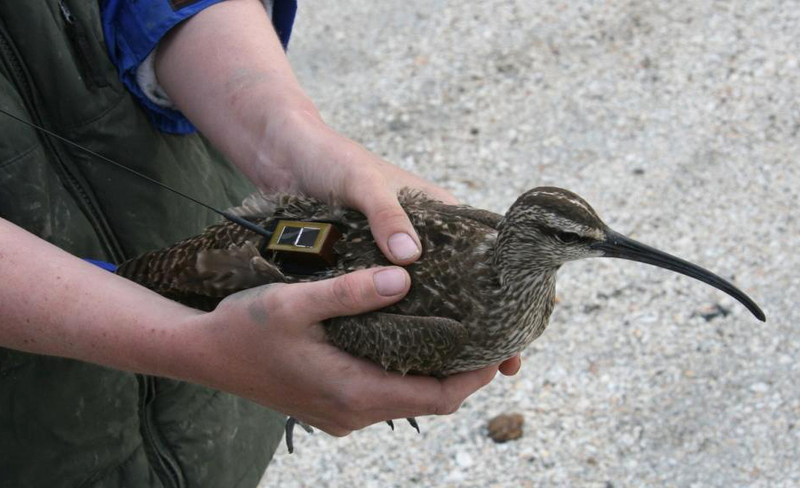 Satellite tracking represents only one aspect of a broader, integrated investigation of whimbrel migration. 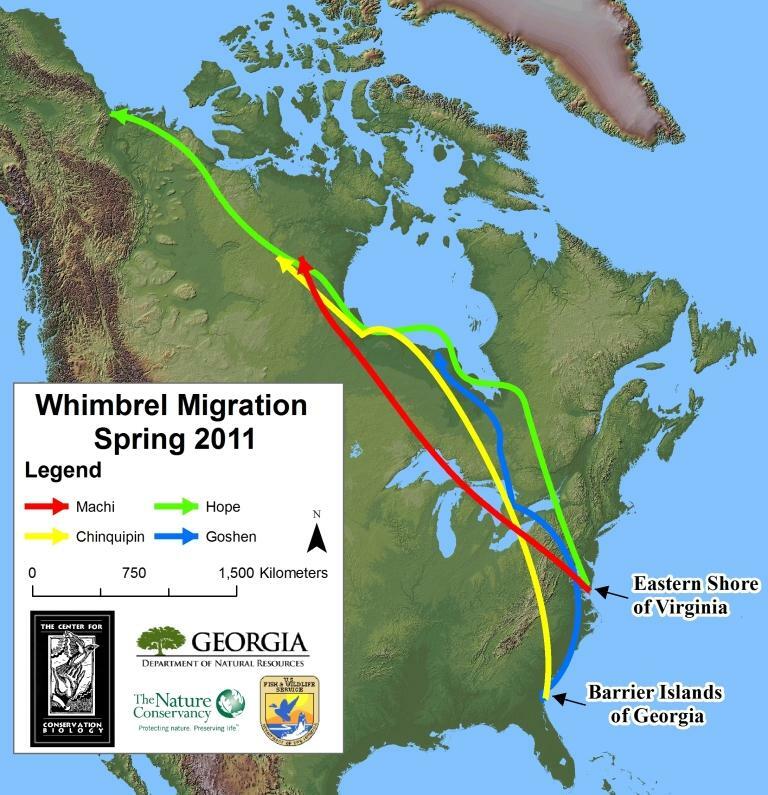 During the past 4 years, the Center for Conservation in partnership with The Nature Conservancy has used conventional transmitters to examine stopover duration, conducted aerial surveys to estimate seasonal numbers, collected feather samples to locate summer and winter areas through stable-isotope analysis, and has initiated a whimbrel watch program. Continued research is planned to further link populations across staging, breeding, and wintering areas and to determine the ecological requirements of whimbrels staging along the peninsula. Funding has been provided by The Nature Conservancy, the Center for Conservation Biology, The U.S. Fish and Wildlife Service, the Virginia Coastal Zone Management Program, The Toronto Ornithological Club, the Toronto and Region Conservation Authority, and the Northern Neck Audubon Society. Tracking map – Map of Hope movements from May of 2009 through April of 2011. She has been tracked using a 9.5-gram, solar-powered satellite transmitter. Photo by the Center for Conservation Biology.